Are you looking for a fast, reliable multifunction Color copier? Then look no further than the Xerox Altalink C8035 Colour copier. This device provides new levels of capability and connectivity for mid-size, large work groups and busy offices. 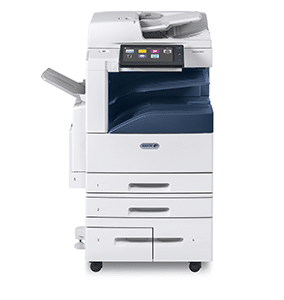 With printing speeds of around 35 pages per minute and first print out time as fast as 6.5 seconds this is a great device for a fast paced office environment. With a great print resolution of 1200 x 2400 dpi you can count on photo-quality color images and crisp text will give your documents clarity and impact. With the touch of a button, you can go to our Xerox App Gallery and download simple, yet powerful, server less apps to your AltaLink color multifunction printer to increase user productivity and shorten everyday tasks. With the option to add a range of accessories including a stapling unit, Envelope kit, and a booklet maker means you can configure your AltaLink device for any work environment and any document type, including booklets, brochures and pamphlets. Additionally the device is enabled for a range of other mobile printing including Apple air print, Google cloud print, etc.